Nigel Ellis of Jamaica confirmed his top talent when winning the 100m during the first day of the Carifta Games in Grenada. His 10.16 (+1.4) is a PB. Ellis is part of the High Performance Sprint Programme of Red Bull. Second was Mario Burke of Barbados with 10.29 and in third was another Jamaican, Raheem Chambers, in 10.35. Jamaica’s Akeem Bloomfield won the 400m in 46.01, with Jamal Walton of Cayman Islands second in 46.23. In the under-18 100m there was also Jamaican gold for Jevaughn Matterson with 10.42 (+1.4) and in the 400m for Christopher Taylor in 47.36. Also to note Trinidad’s Tyriq Horsford threw a meet record in the javelin (700g) with 73.00m. In the under-20 girls 100m, Khalifa St. Fort of Trinidad and Tobago clocked 11.40 to win against a -2.7 wind (also 11.39 +1.2 in heats). Barbados talent Sada Williams won the 400m in a 52.07 national junior record ahead of Shaquania Dorsett of Bahamas 52.50 and Jamaican Tiffany James 52.70. Yanis David from Guadeloupe France won the long jump in 6.48m (0.0). In the youth class, there were Jamaican wins to note by Kimone Shaw 11.56 (+1.0) in the 100m and Shiann Salmon with a 1.82m PB in the high jump. Evonne Britton clocked 13.00 PB (+1.4) over the hurdles, so far the fastest time of the outdoor season at the Springtime Invitational in Texas. Also of note was Abiola Onakoya with a 20.83 (+1.6) in the 200m and Fabian Edoki with a windy 8.02m (+2.3) in the long jump. Three-time world 200m medalist Wallace Spearmon won the 100m in Fayetteville in 10.30 (+1.8). In the women’s 200m there was a windy 22.70 (+3.9) by Taylor Ellis-Watson. Alexis Weeks cleared 4.50m in the pole vault and Raven Saunders got 18.15m in the shot put. The Power Conference Cardinal in Los Angeles had Shayla Sanders clocking a fast sprints double with a 11.13 (+1.2) 100m world lead and 22.77 (+0.1) for the 200m. There was another world lead in the 400m by hurdles specialist Jaide Stepter with a 50.91 PB. Ariel Jones won the 400m hurdles in 56.55. In the men’s 400m hurdles Eric Futch clocked 49.45 over Byron Robinson’s 49.48. Ricky Morgan won the 400m in 45.54 ahead of Kunle Fasasi of Nigeria with 45.76. In Orlando, double 2008 Olympic sprint medallist Walter Dix clocked 10.26 (0.0) and 20.50 (0.0). Olympic silver medallist Jason Richardson got 13.42 (0.0) in the 110m hurdles, second was Jamaican Deuce Carter with 13.52. 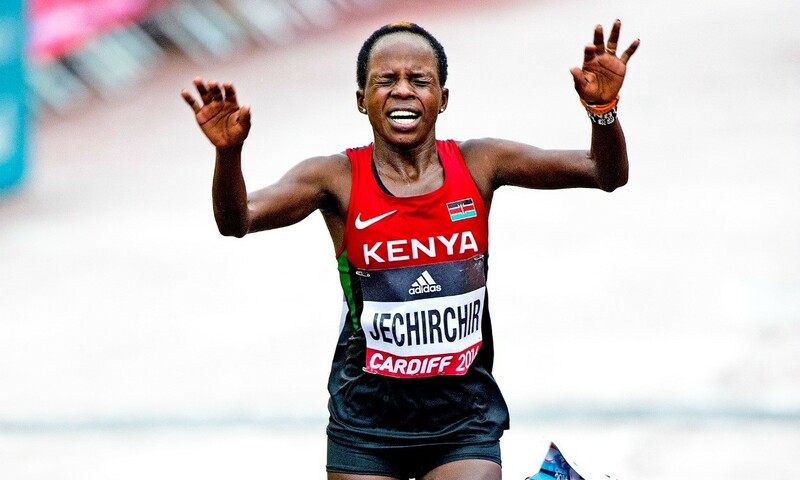 World half-marathon champion Peres Jepchirchir has outlined her plans for the next couple of months. The 22-year-old told the IAAF that she will race in the Yangzhou Half Marathon in April before attempting to qualify for the Kenyan team over 10,000m in Rio.